We did two other craft panels during the convention. Toast, Monkeys, and I did the Make Your Own Igor panel. Monkeys thought it was another sock puppet project, so he was a little disappointed in it. I thought it was really fun, so I was glad he talked us into doing it. 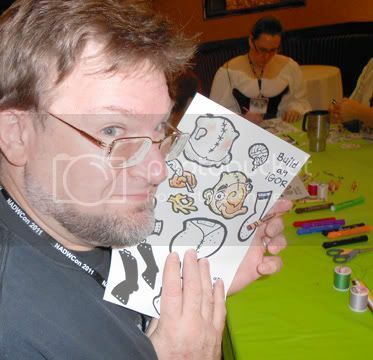 The main Convention Artist drew Igor body parts which were printed on a kind of vinyl paper. There were at least four different sets of body parts, so you were allowed to swap with others at the table for an even more patchwork Igor if you wanted. Step one – color your body parts with colored pencils, crayons, or markers. Step two – cut out the body parts and layout how you want them to be put together, meaning you could have two left hands if you swapped. Step three – sew them together with needle and thread. Simple and easy. Originally they wanted those tabs so that the arms and legs could be jointed, but they couldn’t find them so we sewed. Once again we had a fun table. 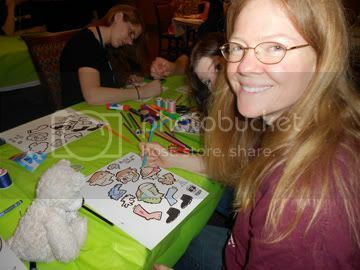 I liked how a group of grown-ups were so focused with crayons, trying to blend and make their creatures turn out the way they saw them in their heads. Meanwhile, despite the serious focus on coloring, everyone chatted about where they were from and what they did there between comments like “pass the blue” and “are you going to use those legs?” and “you wasted perfectly good pin-stripes by not coloring them in, if I’d had those pin stripes they’d be blahblahblah” and “giggle.” Toaster was the only one in our group to finish hers on site, but I did finish sewing mine after I got home and look forward to including him in a Convention Collage project. Also, if I do a Discworld Themed birthday for Monkeys this is definitely a project that will be included. Toaster and I did the Shamble making class. Tiffany Aching is one of my favorite characters, so I was really excited about this one. No real instructions because they said the book wasn’t overly specific other than it kind of looked like a kid’s God’s eye like we made in elementary school art class and that it needed to include something living so they had craft eggs, feathers, and plastic bugs amidst the craft supplies for symbolic “living” creature. They also had buttons, beads, yarn, thread, fake leaves, and who knows what else in unlimited supply. The only limited item was sticks! They couldn’t find enough good sized sticks for the panel so they ordered them from a craft supply company and apparently they were costly! Ha! 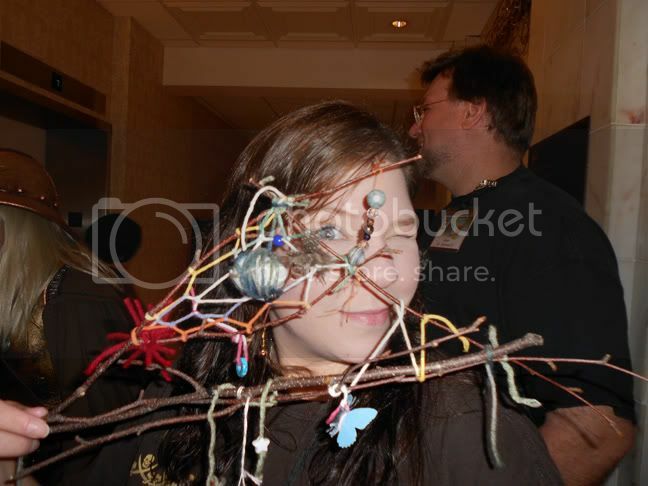 So we each got one branch that we could break into as many pieces as we like. With so little instruction everyone’s project was quite different. 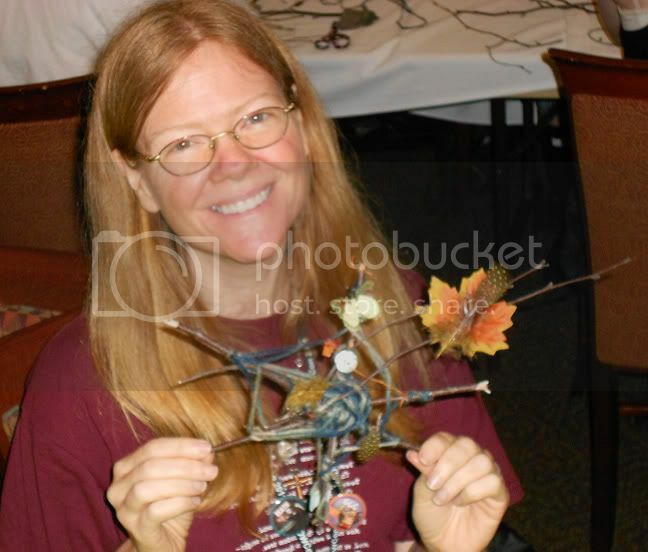 It was fun making them – although gluing the leaves and figuring how to attach eggs was really hard, so occasionally it was frustrating when it wouldn’t do what I wanted it to do. I opted for a butterfly button instead of an egg, but Toast managed to wrap enough yarn around it to get it fairly secure. 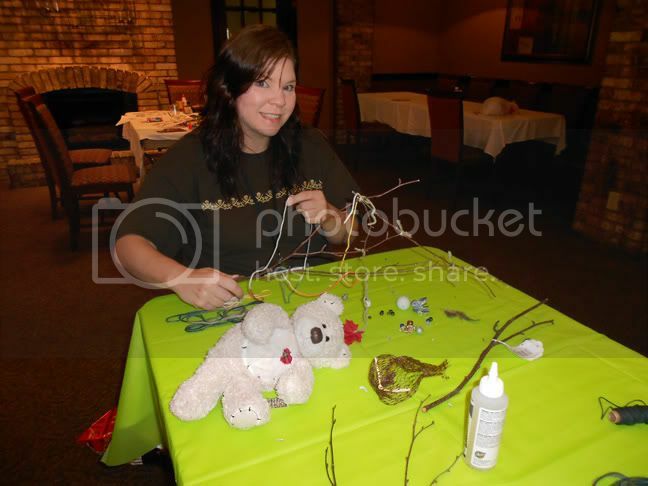 I would do this craft project at a party, too, but I would probably include needles and thread to help with stringing the beads and attaching the leaves. It was also great fun seeing what the other people at the tables came up with. I wish there had been a sharing time at the end to see everyone’s finish Shamble as they were strikingly different shapes and designs. We missed the Design your Own Heraldry class. It was a “if we get there cool but if not then no big deal” – especially for me as I thought it was probably more of a kid’s project. But listening to someone talk about and seeing her design with a whale and a petunia it might have been more than I expected. Apparently the host got into questions like what is your family known for, what are you known for, how do you want people to see you, what are your interests, what affects you, etc. so they put a lot of thought and personality into the designs. Okay, not a craft project, but it was an activity. We signed up for the waiting list, but we didn’t make it back from dinner in time to attend. We wandered in afterwards and regretted missing it. Apparently Morris Dancing is big in Wisconsin, because they had a big group there! One played trombone and one played accordion. Someone dressed as a cow as opposed to a horse; after all, it is Wisconsin. We got to see the dance they taught at that session when they were stalling for the Maskerade judges, and it looked like a lot of fun. We also missed the other dance lesson at the convention, KNEES UP, which was to be something like Scottish Reel dancing. So we really really really need to have a Discworld party.